How personalized send times improve email marketing effectiveness by delivering a message at the right time for each recipient. In recent years, email marketers have been plagued with lower open and click rates, higher unsubscribe rates, reduced deliverability and more and more dormant subscribers. But, don’t fret over declining email marketing metrics. There’s a solution to remedy all that ails you and your email campaigns. It’s called send-time personalization and it fixes all of these issues for different reasons. First, let’s talk about the problems in more detail. Forgive us as we get a bit technical. The Radicati Group predicts that email volume will increase by 4% annually for the next 4 years. Even though your inbox is probably already overstuffed, marketers are still excited to send you even more! The average office employee receives 121 emails per day already. Marketers have turned email into an epic “race to the bottom”- a continual push to compete for the customer’s attention with flashier subject lines and higher volumes. This is just the tip of the iceberg, however. There are larger, more permanent consequences of sending with the “batch and blast” method, like deliverability issues. Worst of all, this happens before subscribers take a look at your content! This ever-exploding volume of email is causing real issues for everyone, especially for marketers. Send-time personalization is here to fix it, though. Below are the 4 common email marketing challenges that disappear when you customize send times to each member of your list. According to Yesware research, 39% of email opens happen within 1 hour of delivery! For every hour that passes, it gets less likely that your email will be opened. Marketers have a narrow window to get an open, but they likely do not know their prospect’s hourly schedule (I hope not). This challenge does not stop at marketing email. If you use marketing automation, you probably have some sort of lead scoring system which determines which prospects should be contacted. But, even if not, you still probably want responses to your sales emails as well. Customer success also relies on email with customers. According to Sendwithus data, product notification emails are the second-most highly opened type of email, behind welcome emails. They have an average open rate of 45%. You might think that 45% is good enough – especially if you’re a marketer challenged with acquiring net new customers. But, better open rates from your customers can have a disproportionate impact on revenue. A famous study by net promoter score-inventor Frederick Reichheld shows that increasing customer retention by 5% will increase profits by 25-95%. That means customer success and product updates create high returns beyond most other similar activities in your business. With personalized send times, you can improve email engagement with all three of these use cases: marketing, sales and customer service. Multiple case studies show that marketers can instantly increase both open rates and click rates by 20%+ by sending email to each subscriber at the right time. 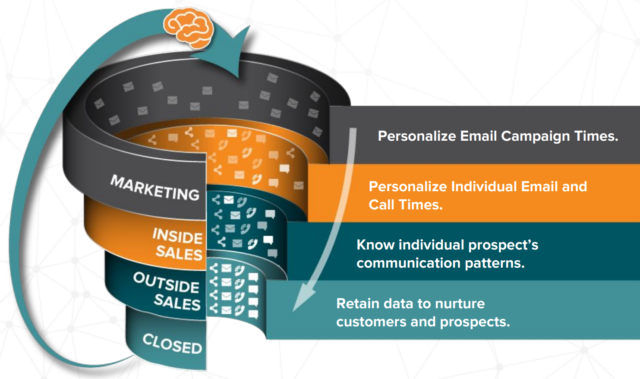 Further, if a lead has received marketing emails in the past, salespeople can leverage the open and click data from those sends to time their email and phone outreach. And even though retention-oriented open rates are already high, send-time personalization can improve that too. Below is an example open and click profile of one contact, straight from Seventh Sense’s interface. Clearly, sending at 4PM on Monday or Tuesday or Friday will maximize your chances of a response. But, as you probably never would have expected, you can increase your chances of a connect if you put your message at the top of this person’s inbox at different times during the weekend too. In a completely rational world, email recipients would only unsubscribe to lists that fail to send useful content. Unfortunately, this is the opposite of reality. According to a MarketingSherpa study, subscribers most often choose to unsubscribe because they receive too many emails in general! This is commonly called “email fatigue”. It does not relate to the quality of your content. In fact, you are probably the victim of frequent marketing blasts from other companies. The subscriber becomes so overwhelmed that he or she must leave a few lists to manage the stress. Here’s an example. In a cross-industry study across 150 million campaign events and 100,000 subscribers, the morning period between 10AM-12PM was shown to have the highest unsubscribe rate. This cannot be solved by choosing one time for your entire list. Subscribers getting emails at inopportune times created the problem in the first place. In fact, an Experian study from 2012 found that there was no single send time that worked for every industry. By sending at dynamic times to each subscriber, you can decrease your unsubscribe rate by 5-10%. If subscribers receive your email at a convenient time, they will take out their email stress on other lists, not yours. Let’s say one company is particularly important to your organization, either because they are a customer or prospective account. If they are customers, you want to make sure that key employees receive emails about your product that make their lives easier. If they are prospects, you want to make sure you get to a “yes” or “no” on your product. But, corporate internet service providers (ISPs) and firewall software ensure that these employees do not get blasted with spam. If specific employees do not open your email because they receive it at an inconvenient time, you will soon end up in their junk folder. 83% of delivery problems are caused by reputation problems, according to ReturnPath. The only difference between engagement and junk folder can be a repeated, inconvenient send time. Also, ISPs look out for emails with the same IP address and body content hitting many employees at once. They can start flagging your email domain as spam once you cross a specific threshold. This can create issues with all future sends to that company’s employees. Therefore, when you can avoid mailing every key contact at once, you make it more likely that future emails will actually get delivered. You preserve your status with the ISP and avoid the spam folders of individual employees. A dormant or inactive subscriber is one that has not opened or clicked an email for 10-20 campaigns in a row. (Different marketers set their threshold differently.) These subscribers may be beyond saving, and will eventually need to be removed from your list to prevent your emails from being flagged as spam by ISPs. 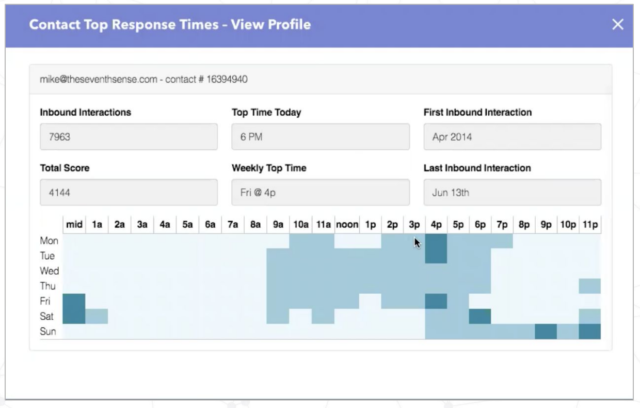 With customized send times, you can rescue up to 15% of ALL contacts from the inactive bucket. These subscribers became dormant because you consistently sent at a bad time for them. They may have simply gotten into a rhythm of deleting your emails due to inconvenient timing. Once you start using Seventh Sense, you’ll be able to see which dormant subscribers have been woken up. Through our Databox integration, you can visualize that data next to HubSpot or Google Analytics metrics to see the impact on traffic and leads too. If you are a marketer in charge of an email list, you probably also find that email continues to be a great use of time and money. A June 2016 survey from the Direct Marketers Association found that email still has a 122% median ROI, far greater than any other channel. Many marketers use marketing automation tools like HubSpot or Marketo or email marketing tools like Mailchimp or Campaign Monitor to send personalized email at scale. However, none of these tools personalize the actual send time of the email to each individual person. Marketers are, therefore, forced to send emails at popular open times, like Tuesday at 10AM based on some article they read online. Unfortunately, this doesn’t work so well. The problem? When every marketer uses these same strategies, subscribers’ inboxes fill up quickly, making it more likely that they will not open your specific email. Or, you may miss the most convenient email review periods for some of your list members. Subscribers solve this problem by deleting your emails right away or worse, leaving your list, simply to cut down on the quantity of emails. Most email services do not have an automated way to do this at scale (yet). Some, like MailChimp, have send time optimization services that can analyze across multiple email lists within the platform. They use past email history from all contacts to recommend one time to send to your entire list. Unfortunately, this does not solve many of the problems listed above. At Databox, we recommend using Seventh Sense to tailor send times to each subscriber. Seventh Sense works within HubSpot and Marketo. It crunches your send and open data from the past and lets you automatically send at the best time for each subscriber, prospect and customer. Multiple agencies in our Partner Program use the service and have seen instant open, click and unsubscribe rate improvements for clients. 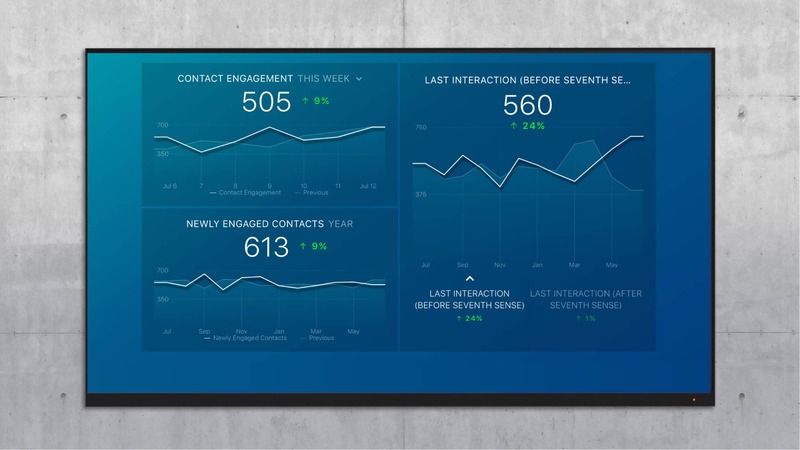 First, Seventh Sense syncs with HubSpot to look at past contact activity on an individualized basis. It uses open, click and content interaction data to build profiles for each of your contacts. All you need to do is set it up once, and it learns from historical data to train its algorithms. Then, every time you want to send an email campaign, you can initiate the send with Seventh Sense, which uses a workflow as the delivery mechanism. You can set parameters for start and end times since you might want an email to go out any time during the week, or perhaps just within one day. Seventh Sense will find the optimal open time for each contact during the specified time period, and initiate the send to each individual. The algorithm gets even more accurate as you send more campaigns. For every contact that opens and clicks emails, the algorithm collects more data and can make better suggestions. 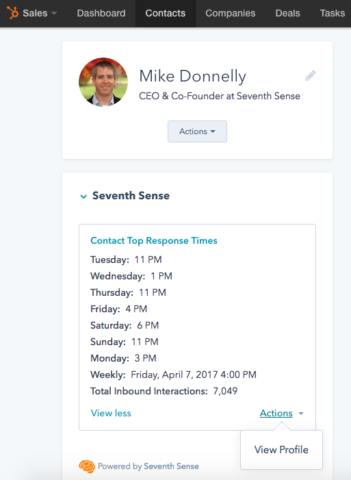 Seventh Sense also automatically exposes optimum send time data within HubSpot CRM for your sales team to time emails and phone calls. Your salespeople can send their emails at times that contacts have proven to be reading email. And, they can actually call at times when emails are frequently opened too, since email habits are good indications of work habits and non-meeting times. Using data from their enterprise customers, Seventh Sense found that calling at frequent open times leads to 38% more pickups from prospects. Prospects may simply ignore your sales team’s emails because they reach them at the wrong time. With more pickups and email opens, salespeople can ensure their pitch is actually being heard. Send time personalization has a few other bonus benefits too. Have you ever sent an email with a typo? Since there’s nothing you can do about it after you click send, I’m not sure what’s worse – the actual mistake or the spelling geniuses that email you back to tell you about it. Sending emails with typos creates embarrassments that range from minor to job threatening. Whether you are cursing at your customers or forgetting to use BCC, you do not want your brand to be represented by filler text and errors. Personalized send times can reduce the scale of these human errors to at least part of your list. Or, if you want to try more intricate split-testing, you could also use personal send times to test a few subject lines or CTAs. Since open rates should be generally higher, you can determine statistical significance on your treatments faster and send higher-performing versions to more list members. Since Seventh Sense costs $100 per month for 15,000 contacts, you are going to get an exceptional payback, no matter how many campaigns you run in a month. 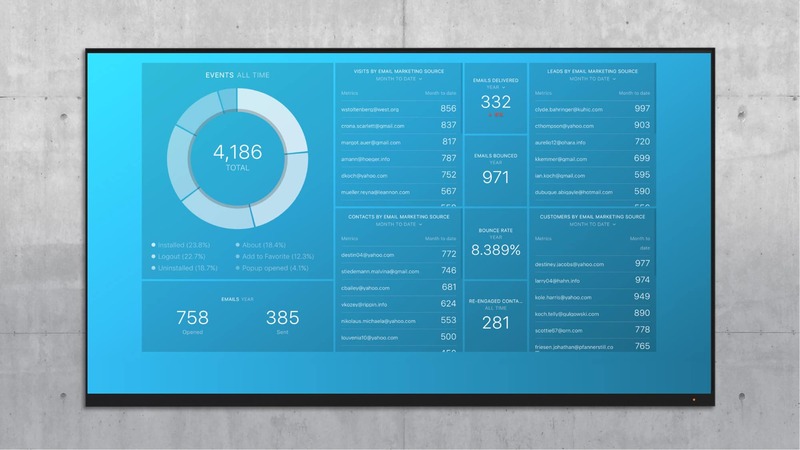 You can also use the Seventh Sense Email Marketing Dashboard to track this in real-time. If your email marketing results have been declining, you can contact Mike (Linkedin, Twitter, Seventh Sense website) for a free consultation and demo. If you’re short on time (haha), a demo only takes 20 minutes.